Previously on my post About SMPH, SMDC and SM Land Consolidation, I mentioned that a news came up regarding the merging of the three. Why is the merging of these 3 great stocks important in deciding whether we keep our shares in SMPH, SMDC or SM? I explained in my previous post that once they merged, only one will remain in the market and there's a possibility of the 2 stocks being delisted. 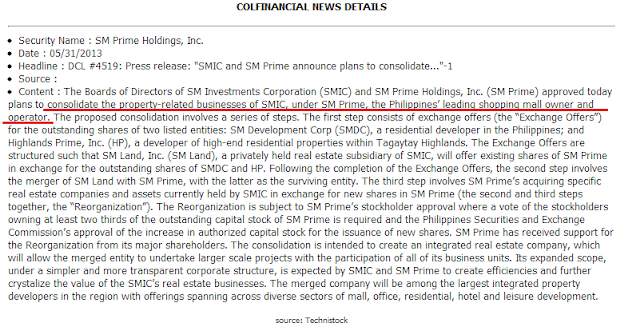 In the above article, it is said that SM Investments Corporation (SMIC) and SM Prime Holdings, Inc. (SM Prime) will be consolidated and the surviving entity is no other than........ SMPH! This is good news as this means that we will still see SMPH rocking the market. Yeah! How will the merging happen? Taken from the above article, there will be series of steps. First step: Exchange offers for the outstanding shares of two listed entities - SMDC & HP. SM Land will offer existing shares of SM Prime in exchange for the outstanding shares of SMDC and HP. Second Step: SM Land, a privately held real estate subsidiary of SMIC, and SMPH will merge. 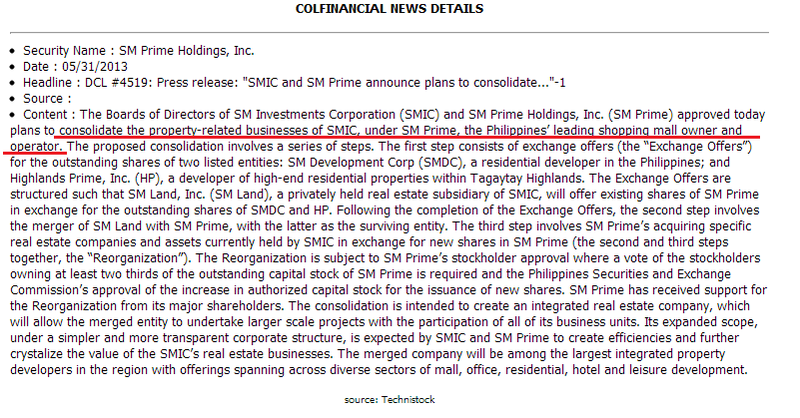 Third Step: SMPH acquiring specific real estate companies and assets currently held by SMIC in exchange for new shares in SM Prime. So I think this is good news for our SMPH shareholders. Let's see the performance of SMPH on the next few days. As for our mentor from Truly Rich Club, there are no announcement on this yet. I am waiting and hoping to receive an update this week, whether the HOLD status will now be lifted. Great site. :) Keep sharing. More Success and Happy Investing! I have a question..Since its already merged.. SMDC/HP have trading suspension..If you have outstanding shares bought from SMDC or HP..What will happened to the shares. ?.How can you sell them? Is it a loss? Thanks for the reply.. There was an exchange offer that happened between June 4 to 12 noon of August 2, 2013 as per COL Financial's news. 1 SMDC share will be exchanged to 0.472 share of SMPH. Were you not able to exchange your SMDC/HP shares to SMPH? If not, then you will have to directly contact SMDC or PSE since SMDC is or will be delisted and will become private. I haven't experienced this yet but I asked some experts in Truly Rich Club on what you can do with the outstanding shares that you have. I will let you know here once I had feedback from them. To avoid this kind of instances, you might want to join Truly Rich Club (TRC) because they give guidance on what stocks to buy and they give alerts if you need to sell a certain stock. You can also reach out to experts in stock market whom you can ask directly through an "FB" like site that we have in TRC. or you can click the image located above the "Search" field in the sidebar. Thanks for posting your question. Some readers might have experienced this as well. I got a feedback from a truly rich club expert on stock market.